← Jesus First rebranded as Congregations Matter. Really? 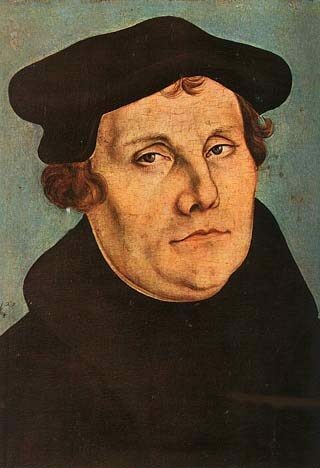 Martin Luther published his edited lectures on Galatians in 1519. In these lectures, we may examine Dr. Luther’s new understanding of justification by faith alone in Christ’s promises. When he commented on Galatians 2:16-21, Luther discussed the difference between divine and human righteousness. First, he identified an external manner of righteousness that results from an individual’s own powers and rests on the performance of the Law. Luther equated this external way to the scholastic teaching on the achievement of righteousness through the dutiful practice of just deeds by obeying the Law. In contrast to this, sinners receive righteousness the inward way by grace through faith in Christ’s Word. This begins with the complete hopelessness of one’s own righteousness like the tax collector who prayed humbly for God’s mercy and was justified before God (Luke 18:13-14). Luther equated this calling upon God with this true, Christian righteousness. Thereby, they become the children of God who gladly do fulfill the Law through faith and love. “Thus it is clear that Christian righteousness and human righteousness are not only altogether different but are even opposed to each other, because the latter comes from works, while works come from the former. No wonder…that Paul’s theology vanished entirely and could not be understood after Christians began to be instructed by men who declared falsely that Aristotle’s ethics are entirely in accord with the doctrine of Christ and of Paul, by men who failed completely to understand either Aristotle or Christ. For our righteousness looks down from heaven and descends to us. But those godless men have presumed to ascend into heaven by means of their righteousness and from there to bring the truth which has arisen among us from the earth.” LW 27: 225. Dr. Luther here reversed the monastic idea of the ascent of the soul to God through prayer and mystical contemplation. Martin the Observant Augustinian Friar had practiced this type of life for many years. With the emergence of the proper understanding of justification, Luther reverses the notion of ascent and reorients the focus toward Christ’s descent through the Incarnation. Notice how he used a common phrase associated with medieval mysticism, inward way, but reversed its meaning. It’s no longer about the Christian’s inward striving or outward works, but Christ’s work for the Christian and in the Christian by faith. I find your OP-title somewhat perplexing. We, as sinnerssaints, do not possess righteousness outside of God’s righteousness (GOSPEL)? Faith in the crucified [corporeal] Lord and His glorious [corporeal] resurrection is sufficent, yes? I have a close relative who is a “Messianic Jew”. I’m not even sure what that really means, but I do know that she and her husband and children believe that churches these days do not preach God’s law properly. They say that they believe that they are saved by God’s grace, but I’m not even sure what their definition of God’s grace is. They lead a very pious life. It’s rather remarkable, however, I really don’t know where they truly believe that their righteousness is. For example, they follow many of the old testament laws that God gave to the Israelites. Pork is an abomination, a castrated animal is an abomination and they will have no part of a bull that has been castrated. They must eat kosher, they celebrate the old testament feasts that the Lord commanded the Israelites to celebrate. They observe Shabbat on Saturdays. They must wear long skirts, and he wears two little yarns or strings on his pants. They believe that Christmas and Easter are pagan holidays. That is probably just the surface of their observances and obedience. They believe that they’re leading a Godly life, that this is how God wants us to live. So I am confused if they really believe in Christ’s righteousness or their own righteousness. I don’t know why they believe they must live like that. Why don’t all of us do that? But isn’t that the old covenant, and we live in the new covenant? First, I’m not a reverend. Second, please re-read the entire blog post. Third, ‘inward’ was not my word, but Dr. Luther’s word. I explained his use of that word in the blog post. With regard to your question, the Theology of Ascent vs Theology of Descent is actually a fairly common set of terms. This goes back to the Christological controversies that were hashed out in the first 400 years of the church. Essentially you had the adoptionists who had a hard time believing that Christ was originally God, and was made incarnate. Because of their Christological view, their view of soteriology was skewed toward a Theology of Ascent. In other words, they believed that Christ was man, and somehow attained divinity and salvation through his works. Their point was that we can do the same. The orthodox view was that Christ was God that came in the flesh as an atoning sacrifice for our sins. In that view of Christology salvation is obtained through God’s grace not our works. In other words, it is a Theology of Descent. If you’re a comic book nerd, think of it as the difference between Batman (adoptionist view of salvation) and Superman (orthodox view). Not sure if that addressed your concern. Hopefully I am not stepping on your toes by speaking up Dr. Phillips.